Gecko fans are fortunate indeed (I included, as I’ve worked with a great many in zoos and the field)…over 150 species are available in the pet trade, many of which do quite well in modest enclosures. Among geckos we find lizards of every conceivable description – rainforest dwellers, desert specialists, burrowers, gliders, giants and many others. Today I’ll review some guidelines that will help you to set up terrariums for a variety of species. The following information can be applied to most available geckos, but details will vary. Please post below for information on individual species. 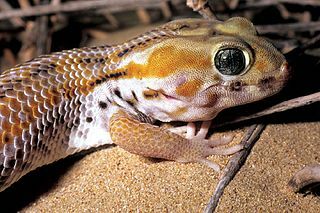 The family Gekkonidae contains over 1,050 species. Among lizards, their diversity is exceeded only by the skinks. Geckos may be found in deserts, rainforests, woodlands and grasslands. Some associate with people voluntarily –the aptly-named House Geckos favor our dwellings, while Tokay Geckos are established in Miami and other large cities. Five species are native to the USA, but approximately 15 have been introduced from elsewhere. Geckos range in size from the 1.2 inch-long Reef Geckos to the stout, 15 inch-long New Caledonian Giant Gecko.